Not everything that catches my eye is a crime against English. I think I will have to start a new category for ‘enjoyable English’. These aren’t exactly things that I would recommend as great piece of writing. But there is something appealing about them. I came across two such examples while looking through last year’s holiday photos, both snapped on the Swanage heritage railway. 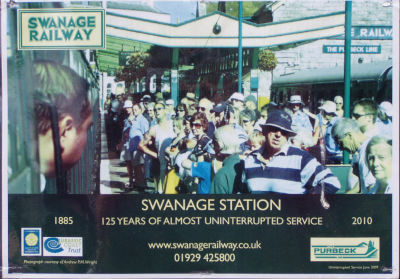 One demonstrates well the art of understatement: a current poster for Swanage railway station boasting of ‘125 years of almost uninterrupted service’. That combination of pride and painstaking truthfulness is very English – and very endearing. 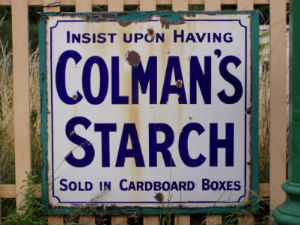 Then there’s the vintage advertisement that tells travellers to ‘Insist upon having Colman’s Starch’. And the reason? It has a great USP: ‘sold in cardboard boxes’. This entry was posted in enjoyable English. Bookmark the permalink.